This is still very much a surfing, cars, girls, beaches and drive-ins album. There is just a great vitality and joie de vivre about it though that makes it irresistible. As always, the hit single, "I Get Around" is the best track on the album by far. Although the melody of "All Summer Long" is totally infectious. It could have been a huge hit single too to be fair. From the lyrics, it seems that miniature golf and Hondas were where it was at. Now for some true Beach Boys heaven. A wonderful vocal harmony intro ushers in "Hushabye" - just listen to the huge, crashing music intro and then more simply glorious vocals. Tracks like these two are certainly not "filler" (an accusation that has often been levelled at the non-single tracks on these early/mid sixties albums). "Hushabye" is one of the group's best ever tracks from this period. It is both sad and uplifting at the same time. "Little Honda" is a fun, lively song about their favourite brand of Japanese motorbike, "just a groovy little motorbike" with a throbbing bass line and great vocals. "We'll Run Away" is a harmonious romantic song about eloping and getting married, a very contemporary theme, as teenagers rebelled against their often dictatorial parents. "Carl's Big Chance" is an impressive, upbeat instrumental (with hints of "Can I Get A Witness"). Some nice guitar parts in it too. It sounds great in stereo. "Wendy" is another summery song with more great harmonies, a candidate for being on a "best of" compilation while not being a hit single, while "Do You Remember" is a breakneck tribute to the early rock'n' roll singers, with a piano intro straight out of "At The Hop" by Danny & Juniors. 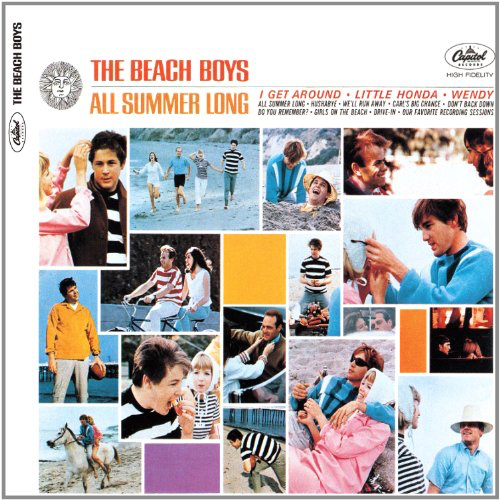 The already nostalgic (for a time they were living in) "Girls On The Beach" is vocally pleasing, but a little bit "barbershop". "Drive-In" is another of the group's regular celebrations of aspects of sixties Americana but, unfortunately "Our Favourite Recording Sessions" is another example of idiotic studio goofery left on the album as a supposed track. Unforgivable. No need for it whatsoever. Thankfully it segues via a great drum beat into the "I Get Around"-esque "Don't Back Down". Overall, this is a pleasant album, without as much of the dreaded "filler" as popularly perceived. Yes, it is lightweight, but so was The Beatles' output at the time. 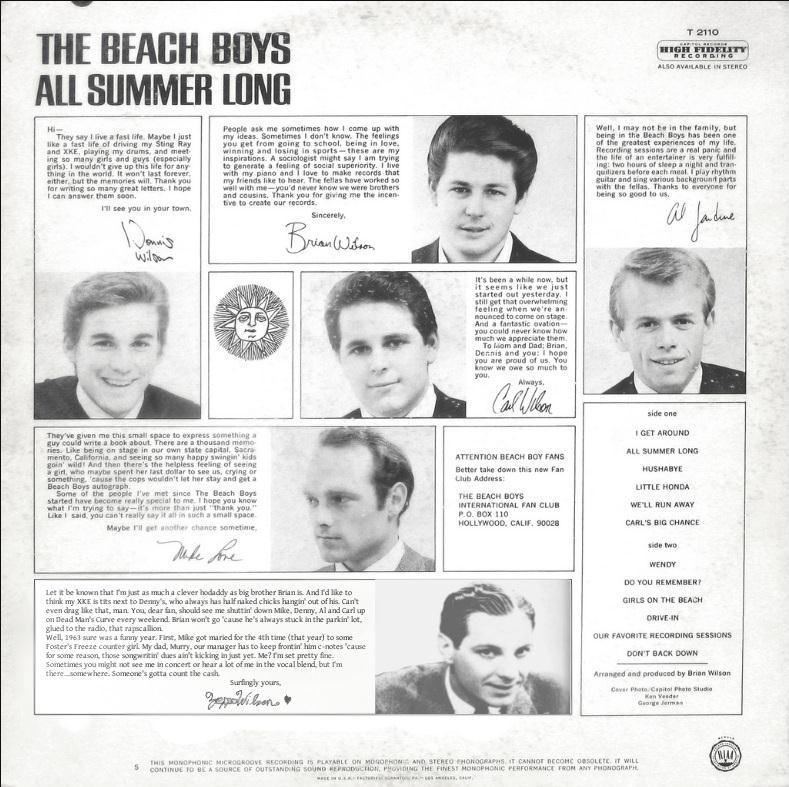 The stereo version is a revelation, showing just how advanced US studio techniques were at the time (compared to The Beatles' rudimentary stereo from a few years later, even). However, the mono version is also enjoyable, with a full, bassy, powerful and balanced sound. Both are worth owning, to be honest.